Another picture from the trip to the Ahr Valley last November. 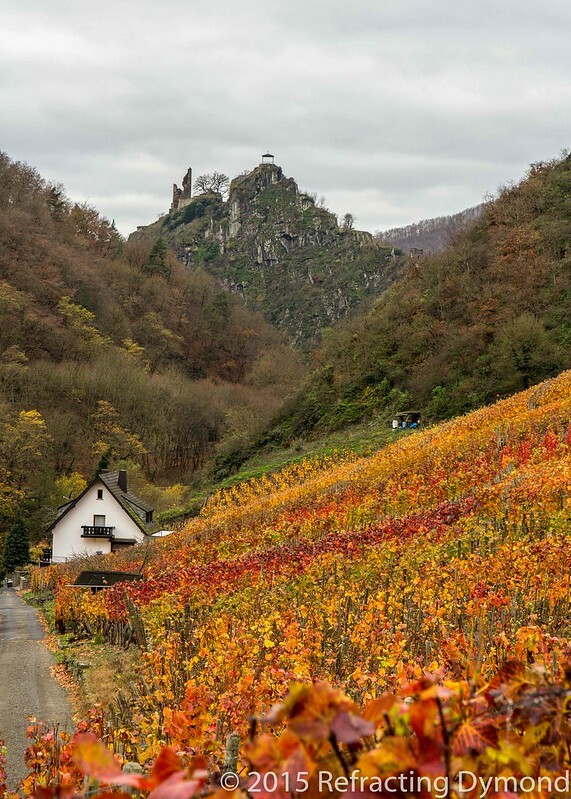 I took think while doing a short hike on the Red Wine Trail, which is a nice trail through the vineyards and steep hills of the Ahr Valley. There are excellent trails and this November day was warm for the time of year. I like how this picture is bursting with color, despite the gray sky. Quite often we expect a colorful sky, especially from someone like me who loves sunset pictures. But here the sky is gray and the vineyards were screaming in reds, oranges, and yellows. It was hard to get a picture that got the detail of the bright clouds together with leaves bright enough, but I was able to capture a good picture and lower the highlights in Lightroom to bring out the clouds. Love this picture. You have captured that certain something that mKes me want to be there. Thank you. You would love the area it’s sooo beautiful!